The study, titled “Experimental Observation of a Current-Driven Instability in a Neutral Electron-Positron Beam“, was recently published in the Physical Review Letters. The study was led by Jonathon Warwick from Queen’s University Belfast and included members from the SLAC National Accelerator Laboratory, The John Adams Institute for Accelerator Science, the Rutherford Appleton Laboratory, and multiple universities. Until now, the study of GRBs have been complicated by two major issues. On the one hand, GRBs are very short lived, lasting for only seconds at a time. Second, all detected events have occurred in distant galaxies, some of which were billions of light-years away. Nevertheless, there are a few theories as to what could account for them, ranging from the formation of black holes and collisions between neutron stars to extra-terrestrial communications. With the assistance of their collaborators in the US, France, the UK and Sweden, the team from Queen’s University Belfast relied on the Gemini laser, located at the Rutherford Appleton Laboratory in the UK. With this instrument, which is one of the most powerful lasers in the world, the international collaboration sought to create the first small scale replica of GRBs. This experiment was not only important for the study of GRBs, it could also advance our understanding about how different states of matter behave. Basically, almost all phenomena in nature come down to the dynamics of electrons, as they are much lighter than atomic nuclei and quicker to respond to external stimuli (such as light, magnetic fields, other particles, etc). Much like research into gravitational waves, this study serves as an example of how phenomena that were once beyond our reach is now open to study. And much like gravitational waves, research into GRBs is likely to yield some impressive returns in the coming years! Roughly once a day the sky is lit up by a mysterious torrent of energy. These events — known as gamma-ray bursts — represent the most powerful explosions in the cosmos, sending out as much energy in a fraction of a second as our Sun will give off during its entire lifespan. Yet no one has ever witnessed a gamma-ray burst directly. Instead astronomers are left to study their fading light. New research from an international team of astronomers has discovered a puzzling feature within one Gamma-ray burst, suggesting that these objects may behave differently than previously thought. These powerful explosions are thought to be triggered when dying stars collapse into jet-spewing black holes. While this stage only lasts a few minutes, its afterglow — slowly fading emission that can be seen at all wavelengths (including visible light) — will last for a few days to weeks. It is from this afterglow that astronomers meticulously try to understand these enigmatic explosions. The afterglow emission is formed when the jets collide with the material surrounding the dying star. They cause a shockwave, moving at high velocities, in which electrons are being accelerated to tremendous energies. However, this acceleration process is still poorly understood. The key is in detecting the afterglow’s polarization — the fraction of light waves that move with a preferred plane of vibration. “Different theories for electron acceleration and light emission within the afterglow all predict different levels of linear polarization, but theories all agreed that there should be no circular polarization in visible light,” said lead author Klaas Wiersema in a press release. Gamma-ray burst 121024A, as seen on the day of the burst by ESO’s Very Large Telescope in Chile. Only a week later the source had faded completely. Image Credit: Dr Klaas Wiersema, University of Leicester, UK and Dr Peter Curran, ICRAR. And to their surprise, the team detected circular polarization, meaning that the light waves are moving together in a uniform, spiral motion as they travel. The gamma-ray burst was 1000 times more polarized than expected. “It is a very nice example of observations ruling out most of the existing theoretical predictions,” said Wiersema. The detection shows that current theories need to be re-examined. Scientists expected any circular polarization to be washed out. The radiation of so many electrons travelings billions of light-years would erase any signal. But the new discovery suggests that there could be some sort of order in the way these electrons travel. Of course the possibility remains that this particular afterglow was simply an oddball and not all afterglows behave like this. Nonetheless “extreme shocks like the ones in GRB afterglows are great natural laboratories to push our understanding of physics beyond the ranges that can be explored in laboratories,” said Wiersema. The paper has been published in Nature. According to astronomer Andrew Levan, there’s an old adage in studying gamma ray bursts: “When you’ve seen one gamma ray burst, you’ve seen … only one gamma ray burst. They aren’t all the same,” he said during a press briefing on April 16 discussing the discovery of a very different kind of GRB – a type that comes in a new long-lasting flavor. Three of these unusual long-lasting stellar explosions have recently been discovered using the Swift satellite and other international telescopes, and one, named GRB 111209A, is the longest GRB ever observed, with a duration of at least 25,000 seconds, or about 7 hours. The astronomers said these three GRBs represent a previously unrecognized class of these stellar explosions, which arise from the catastrophic deaths of supergiant stars hundreds of times larger than our Sun. GRBs are the most luminous and mysterious explosions in the Universe. The blasts emit surges of gamma rays — the most powerful form of light — as well as X-rays, and they produce afterglows that can be observed at optical and radio energies. Swift, the Fermi telescope and other spacecraft detect an average of about one GRB each day. As to why this type of GRB hasn’t been detected before, Levan explained this new type appears to be difficult to find because of how long they last. Levan is an astronomer at the University of Warwick in Coventry, England. He added that these long-lasting GRBs were likely more common in the Universe’s past. The number, duration and burst class for GRBs observed by Swift are shown in this plot. Colors link each GRB class to illustrations above the plot, which show the estimated sizes of the source stars. For comparison, the width of the yellow circle represents a star about 20 percent larger than the sun. Credit: Andrew Levan, Univ. of Warwick. Traditionally, astronomers have recognized two types of GRBs: short and long, based on the duration of the gamma-ray signal. 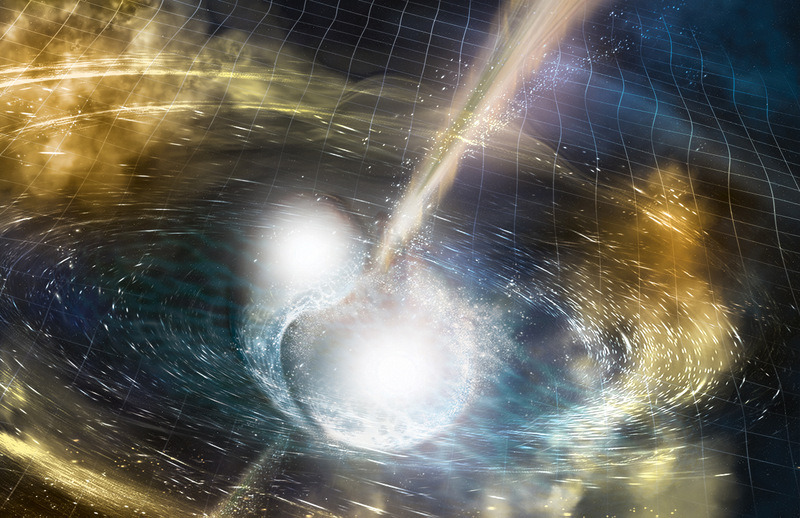 Short bursts last two seconds or less and are thought to represent a merger of compact objects in a binary system, with the most likely suspects being neutron stars and black holes. Long GRBs may last anywhere from several seconds to several minutes, with typical durations falling between 20 and 50 seconds. These events are thought to be associated with the collapse of a star many times the Sun’s mass and the resulting birth of a new black hole. All GRBs give rise to powerful jets that propel matter at nearly the speed of light in opposite directions. As they interact with matter in and around the star, the jets produce a spike of high-energy light. Gendre and his colleagues made a detailed study of GRB 111209A, which erupted on Dec. 9, 2011, using gamma-ray data from the Konus instrument on NASA’s Wind spacecraft, X-ray observations from Swift and the European Space Agency’s XMM-Newton satellite, and optical data from the TAROT robotic observatory in La Silla, Chile. The 7-hour burst is by far the longest-duration GRB ever recorded. Another event, GRB 101225A, exploded on December 25, 2010 and produced high-energy emission for at least two hours. Subsequently nicknamed the “Christmas burst,” the event’s distance was unknown, which led two teams to arrive at radically different physical interpretations. One group concluded the blast was caused by an asteroid or comet falling onto a neutron star within our own galaxy. Another team determined that the burst was the outcome of a merger event in an exotic binary system located some 3.5 billion light-years away. “We now know that the Christmas burst occurred much farther off, more than halfway across the observable universe, and was consequently far more powerful than these researchers imagined,” said Levan. Using the Gemini North Telescope in Hawaii, Levan and his team obtained a spectrum of the faint galaxy that hosted the Christmas burst. This enabled the scientists to identify emission lines of oxygen and hydrogen and determine how much these lines were displaced to lower energies compared to their appearance in a laboratory. This difference, known to astronomers as a redshift, places the burst some 7 billion light-years away. 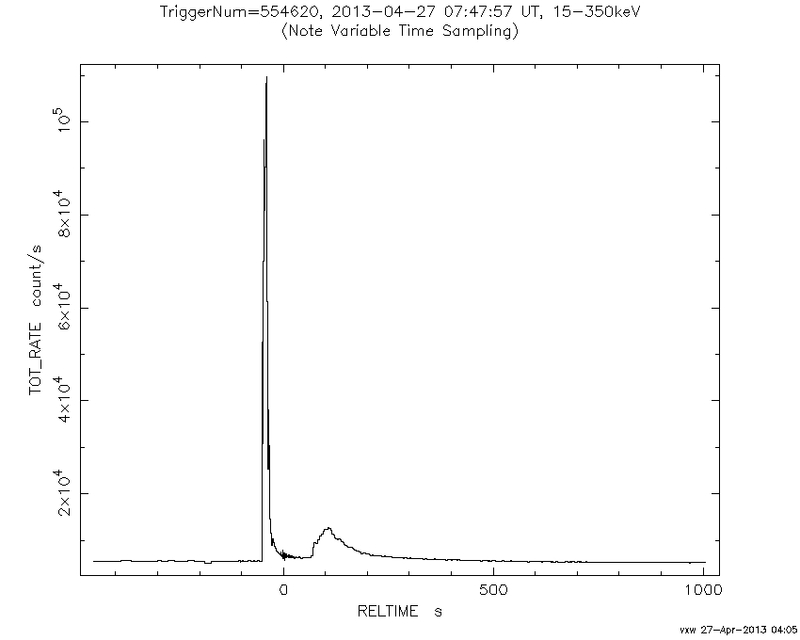 Levan’s team also examined 111209A and the more recent burst 121027A, which exploded on Oct. 27, 2012. All show similar X-ray, ultraviolet and optical emission and all arose from the central regions of compact galaxies that were actively forming stars. The astronomers have concluded that all three GRBs constitute a new kind of GRB, which they are calling “ultra-long” bursts. Astronomers suggest that blue supergiant stars may be the most likely sources of ultra-long GRBs. These stars hold about 20 times the sun’s mass and may reach sizes 1,000 times larger than the sun, making them nearly wide enough to span Jupiter’s orbit. Credit: NASA’s Goddard Space Flight Center/S. Wiessinger. John Graham and Andrew Fruchter, both astronomers at the Space Telescope Science Institute in Baltimore, provided details that these blue supergiant contain relatively modest amounts of elements heavier than helium, which astronomers call metals. This fits an apparent puzzle piece, that these ultra-long GRBs seem to have a strong intrinsic preference for low metallicity environments that contain just trace amounts of elements other than hydrogen and helium. The astronomers discussed their findings Tuesday at the 2013 Huntsville Gamma-ray Burst Symposium in Nashville, Tenn., a meeting sponsored in part by the University of Alabama at Huntsville and NASA’s Swift and Fermi Gamma-ray Space Telescope missions. Gendre’s findings appear in the March 20 edition of The Astrophysical Journal. Paper: “The Ultra-long Gamma-Ray Burst 111209A: The Collapse of a Blue Supergiant?” B. Genre et al. Paper: “The Metal Aversion of LGRBs.” J. F. Graham and A. S. Fruchter. What would a gamma-ray burst sound like? No one really knows, but members of the team that work with the Fermi Large Area Telescope (LAT) have translated gamma-ray measurements into musical notes and have created a “song” from the photons from one of the most energetic of these powerful explosions, GRB 080916C which occurred in September of 2008.